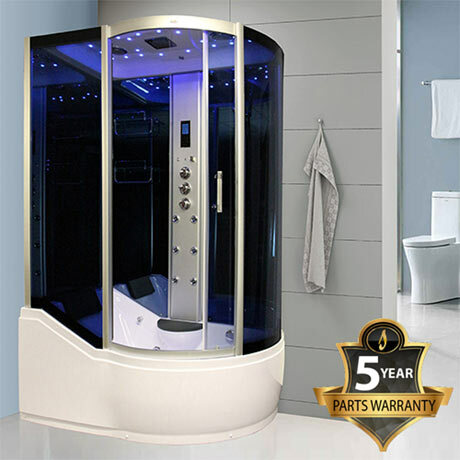 The INS8059 is the latest upgrade in the INS range, a 1700mm hybrid shower/bath steam cabin packed full of features. The control panel features Bluetooth connectivity, which means you can listen to your own music within the cabin as well as the FM radio. The Chromotherapy lighting offers seven different colours that scroll through at a gentle pace to create a tranquil ambience, or alternatively you can fix the lighting on a specific colour if this is your preference. The bath itself has whirlpool jets, meaning you can have a Jacuzzi style bath whenever you choose. The features do not end here, as the column has a cluster of 6 hydro-massage jets, which is located in a convenient position behind the moulded seat. The microphone style hand shower is on a riser rail bar, for optimal height setting. On the opposite back wall, you have two glass shelves for storage conveniently situated. Overhead you have the monsoon rain shower, which is definitely the most popular showering feature across the entire range. Water Pressure/Delivery You need 2.5 - 3.00 bar pressure supply. All our showers are supplied in 4-5 boxes which are designed to be easily transported to your premises and carried in to your bathroom.